This laser toner cartridge compatible with Samsung CLP-500D7K CLP-500D5C CLP-500D5M CLP-500D5Y from InkTonerWeb.com includes 6 cartridges: CLP-500D7K x 3, CLP-500D5C, CLP-500D5M, CLP-500D5Y (Black, Cyan, Magenta, Yellow). They are guaranteed to perform with your Samsung CLP-500, CLP-500N, CLP-550, CLP-550N Laser printer. It is compatible with the original Samsung CLP-500D7K CLP-500D5C CLP-500D5M CLP-500D5Y toner cartridges. Our (generic) replacement laser toner cartridges compatible with CLP-500D7K CLP-500D5C CLP-500D5M CLP-500D5Y are made in ISO9001 & 14001 factories and meet the highest standards of quality, reliability and exceptional yields, offering high-quality printing results. 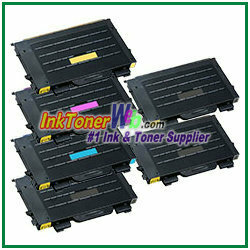 The high quality toner cartridges compatible with CLP-500D7K CLP-500D5C CLP-500D5M CLP-500D5Y from InkTonerWeb.com are an economical option to expensive OEM Samsung CLP-500D7K CLP-500D5C CLP-500D5M CLP-500D5Y laser toner cartridges. The use of compatible replacement laser toner cartridges and supplies does not void your printer's warranty. We offer a 100% Quality Satisfaction Guarantee on our laser toner cartridges compatible with CLP-500D7K CLP-500D5C CLP-500D5M CLP-500D5Y. You can shop for toner cartridges compatible with CLP-500D7K CLP-500D5C CLP-500D5M CLP-500D5Y for use in Samsung printer models CLP-500, CLP-500N, CLP-550, CLP-550N online from us. All our remanufactured or compatible inkjet cartridges and laser toner cartridges contain at least as much ink or toner as original manufacturer products. So no matter which kind of printer you have, you can be assured that we can help you reduce your printing costs.